Since the end of Israel’s 2014 military offensive against the Palestinians in Gaza, which lasted 51 days, the besieged coastal territory has been the scene of endless armed incursions. Hundreds of Palestinians have been killed, injured or maimed when a truce is supposed to be in place. Endless efforts mediated by regional countries have tried to put pressure on Israel and the Palestinian resistance factions to abide by the terms of the truce to provide some calm in one of the most volatile regions in the world. However, the atmosphere enveloping the 2 million people in Gaza this week is similar to that which existed just before the outbreak of Israel’s 2012 and 2014 offensives. Israel decided to violate the terms of the Egyptian-brokered deal and send in an undercover unit to assassinate a leading Hamas commander. The surprise attack was discovered and thwarted by resistance fighters, several of whom were killed when the Israeli forces called in air support to cover their withdrawal. A senior Israeli officer was also killed, and one was wounded. It is suspected that the Israelis were attempting to provoke the resistance and show that Israel has the upper hand. Usama Hamdan, a Hamas official living in exile, said that the operation was to show that the Israeli army is capable of hitting at any time. Along with other Palestinian factions, he insisted, Hamas will not sit idly by. “We said before that we will meet calm with calm, and fire with fire,” he added. What’s more, according to some analysts, Israel wanted to strike a blow against Hamas by killing important military commanders and destroying facilities and sites. This was important for the Israelis before agreeing to any deal that might see the lifting of the 12-year siege on Gaza and a prisoner swap releasing Palestinian political prisoners from Israel’s jails in exchange for soldiers captured in 2014, alive or dead. The Palestinians have thus witnessed the most dangerous military escalation in over 4 years. They are bracing themselves for more, and a possible major offensive. 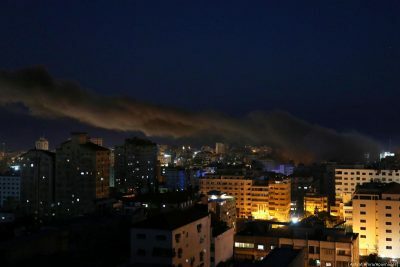 Over forty Israeli air strikes have been carried out so far across the enclave, destroying several residential buildings and the Hamas-affiliated Al-Aqsa TV facility, as well as Al-Amal Hotel. It’s clear that Israel has managed to gather a bank of targets over the years through its non-stop surveillance. The response of the resistance factions was quick to come, with more than 250 home-made projectiles fired from Gaza into Israel in retaliation for the killing of fighters and civilians. Israel’s “Iron Dome System” was in action, intercepting the “rockets” before they could land. Officers have called repeatedly in recent years for the restoration of the Israel Defence Forces’ “deterrence power”, but the tone has become harsher this time following the retaliatory rocket fire from Gaza. This coincided with the airing of footage showing a military vehicle targeted by an anti-tank missile across the border east of Gaza, in which the high ranking Israeli officer was killed and another injured. This was a blow to the IDF’s prestige, as scores of its soldiers were within range. Had the resistance really wanted to seek revenge it would have been a rare opportunity to do so, but it was clearly a message that the Palestinians can also start and end the game while dictating terms. At the time of writing, at least three Palestinian civilians have been killed and scores injured by the Israeli air strikes and artillery bombardment, not to mention the panic caused among the population, especially the children. There are no fortified bunkers in Gaza in which they can seek shelter, and it is one of the most densely populated areas in the world; not for nothing is it known as the world’s largest open air prison. The Palestinians have no warplanes, tanks, naval gunships or heavy artillery to defend themselves against Israel’s army, navy and air force equipped with the latest technology and weapons. As the military situation continuous to deteriorate, a joint operations room has been formed by the resistance groups to coordinate their response. Threats and warnings have been made by both sides. Israel can spread terror, kill on a massive scale and cause untold destruction, but cannot guarantee that it can destroy the spirit in the “capital of resistance“; the Palestinians in Gaza, meanwhile, have nothing to lose. Conditions are unbearable, which explains why young, unarmed people have been taking part in the Great March of Return protests along the nominal Gaza-Israel border for 33 weeks in a row since 31 March when Palestinians marked Land Day. Over 190 Palestinians have been killed by Israeli snipers, including journalist, paramedics and even food and drink vendors. The protestors are armed with slingshots and incendiary kites and balloons. The protests were planned following US President Donald Trump’s move in December last year to recognise Jerusalem as Israel’s capital. They are a real headache for Israel due to them becoming a war of attrition which is extremely costly. The Israeli government is willing to reach agreement with Hamas on its own terms and conditions, but this is rejected by the movement’s political and armed wings and the other resistance factions. This explains Israel’s frustration, hence the latest targeted assassination operation and bombardment of Gaza. Hamas’s main rival, Fatah, has condemned the Israeli attacks on the Gaza Strip. A Fatah spokesman in the territory, Atef Abu Saif, described them as “barbaric” and a continuation of Israel’s crimes. Abu Saif stressed that such offensives will not break the will of the Palestinian people. As the de facto government in Gaza, Hamas has been at loggerheads with the Fatah-controlled Palestinian Authority in Ramallah for the past 12 years. Abu Saif’s statement, though, is evidence that the Palestinians are united in the face of Israel’s indiscriminate attacks; there is no room for recriminations, and all differences are put aside. What is important now is to protect the internal front and be careful of rumours that are intended to weaken the morale of the people in Gaza. The Strip has been used by Israel for years as a “laboratory” to field test new ammunition and weapons on unarmed civilians and their infrastructure. Gaza’s Palestinian residents don’t deserve this; they are tired of urging the international community and the UN to intervene and put an end to their suffering, humiliation, fear and isolation. Action is needed now to prevent another major Israeli offensive that we are all expecting.